For a long time there had been a Dominican laity connection, largely the result of active encouragement by the sisters ever since they came to Aotearoa New Zealand. A Dominican Third Order group was set up many years ago in Invercargill, and some of those people still carry the Dominican torch. Colleen Hopwood went a step further and made a formal commitment to the Order, while continuing to live and work in the community. From time to time other groups have started up: the Auckland and Wellington ex-pupils, the “three Marys” (Easton, Betz and Nash) who used to meet with the sisters in Palmerston North (that group, now enlarged, continues to meet). People from the deaf community, such as Danny Beech RIP kept in contact with sisters like Molly, Dominic and Maureen. When Mary Anna and Peter were respectively Asia-Pacific Dominican Council reps they were very active in travelling to the various Dominican centres. There was a busy focus group of lay people who met with them regularly and helped develop the peace and justice formation. The time came to form an independent lay function of the Dominican Order. 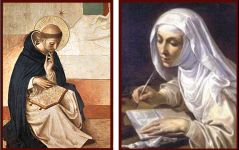 On 16 March 2008 Mike Kelly sent out a letter to a group of people whose names he had collated on to a list of lay people who had indicated an interest in the spirituality initiated by St Dominic and St Catherine of Siena. “At present in New Zealand there is a structure for the Sisters and a priory for the friars. A while ago a few of us wondered about setting up some way of connecting with lay people who like to be identified as Dominicans. In some parts of the world there is a quite formal Dominican apostolate – tertiaries and similar. In New Zealand people call themselves Dominican in a variety of ways – some groups of different kinds, and a number of individuals finding their own way. On 8 March six of us – two from Auckland (Susan Healy and David Tutty), one from Palmerston North (Trish Corboy-Carr), one from Dunedin (Maria O’Connell) and my wife Jenny Wilson and I from Masterton, met to discuss whether a lay link was a good idea. We considered with gratitude the work the sisters have done in the past in keeping the connections alive, but wondered whether as part of the Dominican family lay people ought to take some responsibility. We decided that in a changing world and a changing Church, in New Zealand at least, anything formal was not what was needed. What we thought would be useful was a regular newsletter that kept people in touch with initiatives of the friars and the sisters; gave lay people the option of contributing to some of those activities and perhaps even initiating some ourselves; and offered ideas on how some people in New Zealand walk the Dominican path either via groups or in other ways. the importance of the Dominican charism continuing in Aotearoa /New Zealand. We then considered what might be the aims of a national lay Dominican movement. To live and promote the four pillars of Dominican life: prayer, study, community, and preaching. Since this beginning in 2008 we have had two national gatherings of laity – the first in Wellington in 2010 and the second in Auckland in 2014. In 2012 a survey of the laity was taken with a profile developed which is published on our website (http://www.dominicans.org.nz/dominican-family-projects/profile-of-nz-laity/). Today in 2015 we have over 300 people on the mailing list and a newsletter that goes out three or four times a year. Representatives from around the country contribute to a consultation group sharing news and encouraging local and regional gatherings and other initiatives. Laity have taken the lead in developing and keeping current the website for the Dominican Family in Aotearoa New Zealand (http://www.dominicans.org.nz) and the Facebook page (https://www.facebook.com/groups/dominicansaotearoa). Lay Dominicans continue to live out the Dominican Charism in many ways throughout the country. We give thanks for those who had the vision to initiate this Dominican laity network in Aotearoa New Zealand. We are always pleased to share news and photos. Please contact us by email or Facebook.